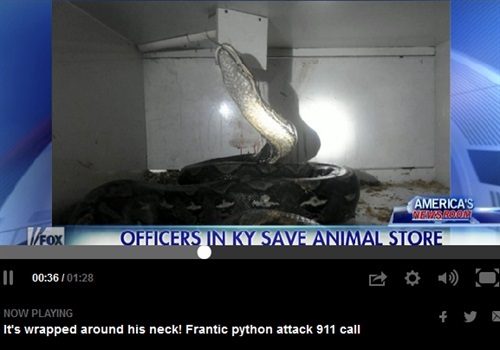 The owner of a northern Kentucky reptile store is recovering after police officers pried off a 20-foot python that was crushing the man, reports the Associated Press. Newport police tell local news outlets that owner Terry Wilkens was feeding the snake Monday morning when the 125-pound python attacked. Police Chief Tom Collins says Wilkens wasn't breathing when officers were trying to free him, but he did resume breathing before he was taken to a hospital. Collins says Wilkens' health appears to be improving and he's even talking.